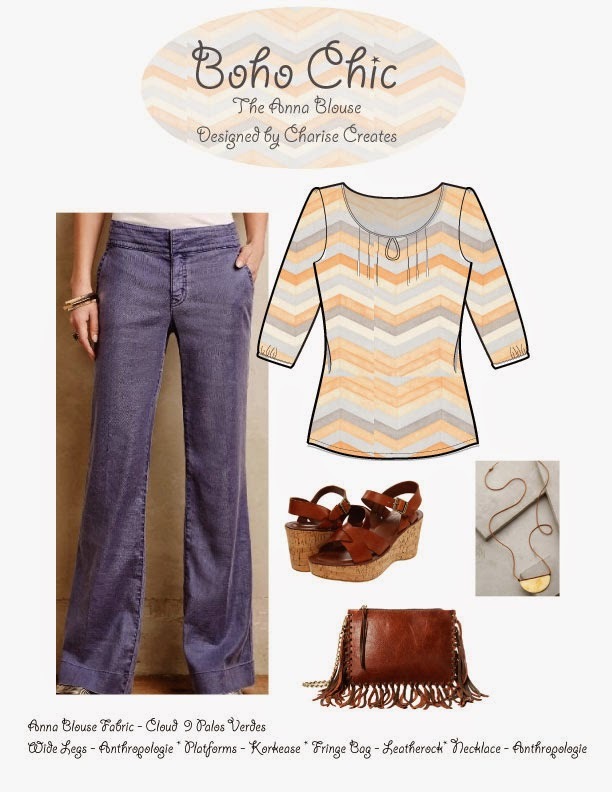 Charise Creates: How will you wear your Anna Blouse this Spring? I had an absolute blast coming up with these design boards! They are all Spring themed and will give you a few ideas of how to wear your Anna Blouse. Many of the items of clothing and shoes you probably already have in you closet but I have listed the sources for the items so you do a little shopping if you wish : ) All the Anna's are shown with current and/or fabrics that can be found in fabric shops now. I love this Retro Feminine Look! The Cotton + Steel Rayon print is so pretty and Springy in the Anna Blouse and looks so cute with The Lovely Gathered Clutch also in Cotton + Steel! The Border fabric is Dottie Cousin in Bright Plum. The "Jacks" fabric is Playroom Linen in Aqua. I love the ease of denim and this skirt (from Anthropologie) is such a perfect basic to have in your wardrobe. The shoes (also from Anthropologie) are adorable but this look would also be so cute with ballet flats! I will wear this look for a few more weeks with black knee high boots since it is still a little chilly in the Pacific Northwest! The trench from Modcloth is the icing on the cake and the perfect staple for your Spring Wardrobe. I am always looking for ways to pull my look together for running around town doing errands. 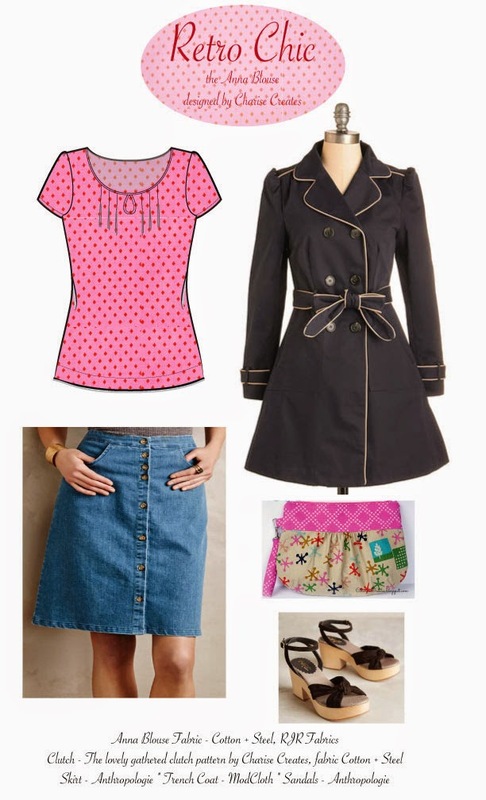 These items combines casual clothing items that get dressed up with cute shoes and a blazer. The Anna shown here is made with an adorable Cotton Lawn from Girl Charlee Fabrics. I love the large floral print in the Shopper Purse from the lovely gathered purse trio. It is extra large for your shopping excursions! 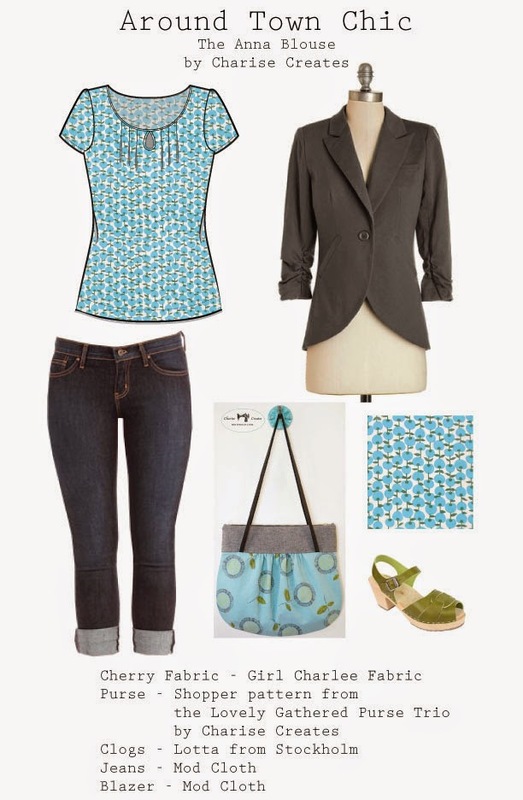 Pair these pretty printed items with a pair of cropped jeans and blazer from your closet or you can find the items pictured from ModCloth. Add some fun colorful clogs from Lotta from Stockholm to top off the look. If it is still chilly in your locale, you can switch out the clogs for knee high or ankle boots - a perfect Winter to Spring transitional outfit. The 70's are back and I couldn't be happier. I love wide leg pants and these from Anthropologie are adorable. I love them paired with this version of the Anna Blouse in a chevron voile print from Cloud 9 fabrics. Add some retro cool sandals (these are from Korkease) and a trend setting fringe bag. A piece of modern jewelry tops off this cool look.